Spiced Persimmon Cake – I'll Make It Myself! I tend to eat Fuyu persimmons plain, but I was inspired by The Food Librarian‘s “Fuyu Persimmon Bundt” to try something new. I used a sweet seedless variety (hiratanenashi, 平種無) with a cinnamon-colored flesh in one batch and a seeded variety with orange flesh in another. Both work equally well, though the color of the cake will vary based on the fruit. (Remove the seeds, of course, if applicable.) 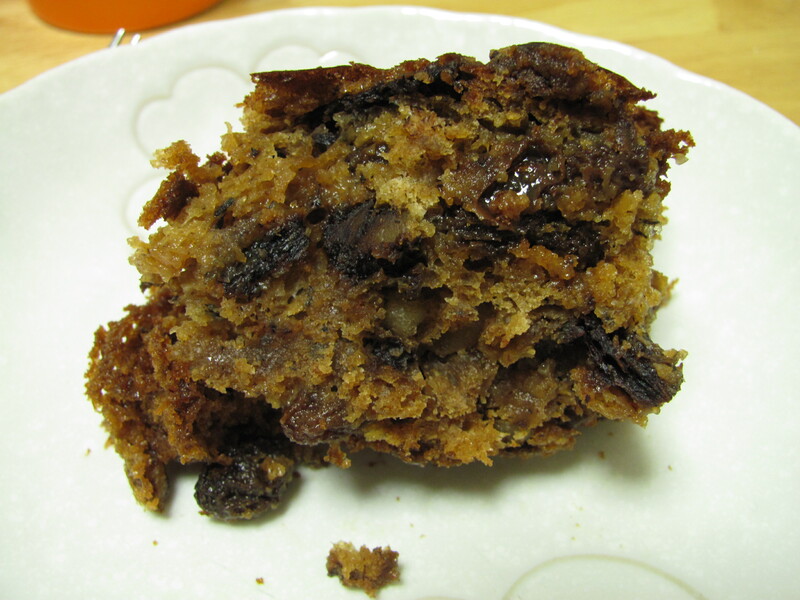 My coworkers compared this cake to a Western-style Christmas cake, combining sweet fresh and dried fruits with nuts and spices. I think I know what I’m making instead of Stollen for Christmas this year! My alterations: The night before I made the first round of this cake, I was out of butter, so I swapped in yogurt 1:1 by volume. Also, I think the natural sweetness of the persimmons more than makes up for the comparative lack of sugar in my version. This is also a half-size recipe to accommodate for the size of Japanese oven-ranges. The original recipe is here if you want US measurements and the full-size recipe. 1. 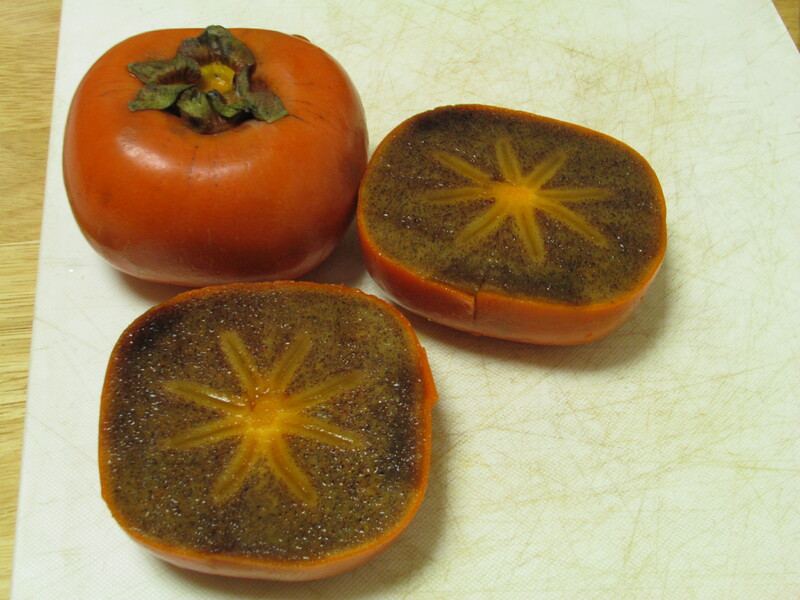 Peel and chop persimmons into bite-size pieces. Remove seeds if necessary. 2. Mix the persimmons with the baking soda in a medium bowl and set aside. 2. In another bowl, mix the yogurt with sugar until the sugar is totally dissolved. Add the egg, then lemon juice and vanilla. Mix to incorporate. 3. Add the persimmon and baking soda mixture to the wet ingredients. 4. Whisk together flour, baking powder, cloves, cinnamon and nutmeg in a bowl, then add to the wet ingredients. 5. Gently fold in the walnuts and raisins. 6. Fill muffin cups about 3/4 full or fill a greased brownie pan with batter. 7. Preheat oven range to 170° C. Bake about 40-45 min., until a chopstick comes out mostly clean. The cake should be soft, but solid and springy (not indented). N.b. The batter is very dark and will get even darker as it cooks. If you are concerned about the cake burning, place tinfoil over the top near the end. The juiciness of the persimmons and the texture of the yogurt make cause the cakes to take longer to bake. 8. Store in an airtight container or wrap foil over the brownie pan. This is a very moist cake, so it’s best to eat this within 3-4 days of baking if left at room temperature. *Hachiya are good in oatmeal and great for faux-sorbet. Lovely cake! Your Fuyu’s color is so rich and different – love it! Pingback: Kitchen Library – 2012.12.20 | I'll Make It Myself! Pingback: Update: Spiced Persimmon Cake | I'll Make It Myself!